Nar Gurung, New Roots and PhotoVoice Participant, talks about how she sun dries her vegetables to preserve them throughout the winter. From December 18th 2018 - February 8th 2019, two students working with Professor Kirsten Gelsdorf of the Humanitarian Collaborative, Melissa Katz (CLAS ‘19, Media Studies) and Chandler Collins (Batten ‘20, Public Policy & Leadership and Global Development Studies), collaborated with the International Rescue Committee’s New Roots program to produce an exhibit of photographs and study community feedback from a PhotoVoice project conducted during the summer of 2018.
understanding of a community project, issue or concern. 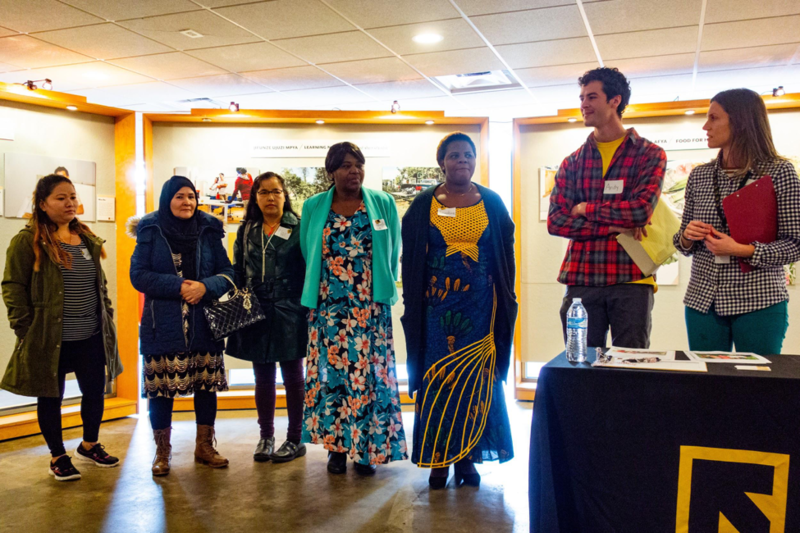 The IRC’s New Roots program is a multi-faceted food and agriculture initiative that provides land access, material support, and education in support of refugees and other immigrants’ community connection and household economics. The team wished to answer the question “How has New Roots affected my life?” as part of an evaluation process of their program and culmination of a three-year “Making Refugees Welcome” project with the NoVo Foundation. Using photographs and quotes generated by New Roots participants, an exhibit of their findings, with support from the Humanitarian Collaborative, was held from January 22nd - January 30th 2019 at the Charlottesville CitySpace venue. A meeting with the photographers/participants, community members and stakeholders was held at the exhibit on January 26th 2019 that included talks about each photograph by the photographer and shared food cooked by the participants using recipes representing their home country. The photographers gather on the 26th of January 2019 to share their work and talk about their photographs with the community. Maryam Yousefi (New Roots and PhotoVoice Participant) and Melissa Katz (CLAS ‘19) sample food cooked by the participants, representing cuisines from Afghanistan, Bhutan, and the Democratic Republic of Congo. What was revealed through the exhibit is a stunning picture of how immigrants and refugees economically and culturally enrich our community and how programs such as New Roots are an integral part of facilitating the resettlement of displaced peoples into a new country. Word Cloud of concepts identified by the PhotoVoice process and community response to the exhibit. The participants identified five main benefits from their work with New Roots: Staying Healthy, Saving Money, Food for Health, Learning New Skills, and Community. What came into focus is how the New Roots program is not just about farming or gardening, but helps refugees develop the tools to establish a sense of independence, take control over their financial future and to nurture community and a sense of home. Equally fascinating was the community response to the exhibit. Comments from community members identified Uniting Cultures, Building Community and Creating a Home as primary takeaways. Food, and the growing of food, seems to be a fundamental way that we connect with our world and helps us define a sense of home. This finding even has corollaries in popular culture. Writers such as Michael Pollan have been at the forefront of a movement that strives to connect us to where our food comes from and posits that we have lost something by giving up our hand in the process of feeding ourselves and transferring these responsibilities to corporations. The stories told by the refugees, through their images and quotes, reinforced these ideas and revealed the benefits of being actively involved in food production and the food economy. Students learned that the PhotoVoice process and exhibit helped surface important concepts and effectively gave the participants a forum for their voice to be heard, both empowering them and breaking down notions of “us” and “them”. At a time when UVa is focused on improving its methodologies of community engaged research, this provides a compelling test case. Melissa Katz, (CLAS ‘19) & Chandler Collins, (Batten ‘20) help hand out name tags to community members during the January 26th PhotoVoice stakeholder meeting. From the participants, we learned about the importance of food, farming and gardening in helping displaced populations build new communities and create new homes. We also learned how New Roots’ work facilitates this process. Many of these same ideas that help displaced peoples establish themselves in new communities are just as important to those who are already residents. The PhotoVoice process proved effective at creating a bridge between seemingly disparate communities with vastly different backgrounds, highlighting how much we have to learn from one another and our endless capacity to connect when we take the time to listen. What also emerged was how empowering being involved in the PhotoVoice process was for the participants, creating a forum for their voices to be heard by both organizations and the broader community. This enabled the participants to take control of their message, to influence the organizations and institutions that work with them, to participate with the community and to plot a course towards their own independence. Unlike typical survey methods that can be intrusive and have little immediate or tangible benefit to their target populations, this project created actionable insights that preserved the human nature and integrity of the issues being studied by elevating the participants rather than reducing them to a statistic in a survey. PhotoVoice is just one example of how participatory research can surface people’s stories, providing the community with easy to understand, timeless lessons that bridge cultural and language divides and that exalt in our shared humanity. This project was made possible thanks to Brooke Ray and Andy Blunk from the IRC New Roots program who invited us to participate with the project, Kirsten Gelsdorf from the Humanitarian Collaborative for providing the resources to produce the exhibit and conduct analysis and Melissa Katz and Chandler Collins for providing support with data collection as well as designing and hanging the exhibit, and the NoVo Foundation. Finally and most importantly I’d like to thank all the participants, Man Rai, Sanchi Gurung, Maryam Yousefi, Budhi Subba, Josephine Kanyamukenge, Dhan Subba, Nar Gurung and Elizabeth Ndolo. Without your hard work, creativity, insights and generosity, none of this would have been possible.